Built in an olive grove, and surrounded by beautiful gardens, all studios offer magnificent views of the emerald, crystal clear waters of Lourdas Bay and the island of Zante. The studios feature a fully equipped kitchenette, with fridge and microwave oven, rustic stylish beds and private bathroom. A variety of mini markets, restaurants, shops and tavernas, as well as the marvelous Trapezaki beach are just a stroll away. Hotel tip: Family Apartment 5 persons. I would like to say before I tell you some of the best and worst places in Lindos that I have been going to Lindos for the last 10 years and I love the place! Best Bars; Yannis Bar, Niko's bar, The museam bar Byzantine wine bar and The dolfin snack bar! Best Nightclub: Archers! I hope you will get a chance to vistit Lindos!it really is worth visiting! One word describes these apartments - basic! Having said that, they were spotlessly clean and ideally located for both the beach and town. Facilities are limited; imagine my horror to discover no kettle; how's a girl supposed to get out of bed in the morning without a cuppa??! Forced to use a saucepan on the incredibly slow cooker rings! The shower looks as though it's seen better days too, we were amazed it worked as effectively as it did. Not the place for you if you have mobility problems; 115 steps to the door! However, if walking is difficult for you, Lindos as a whole might present a problem. 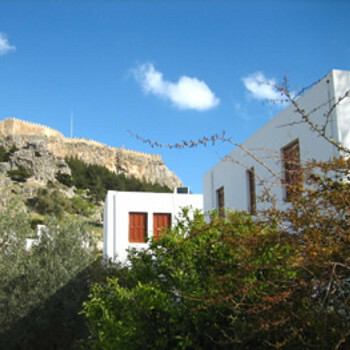 Overall for a cheap and cheerful place to stay, you'd have to go a long way to beat Eleftheria.